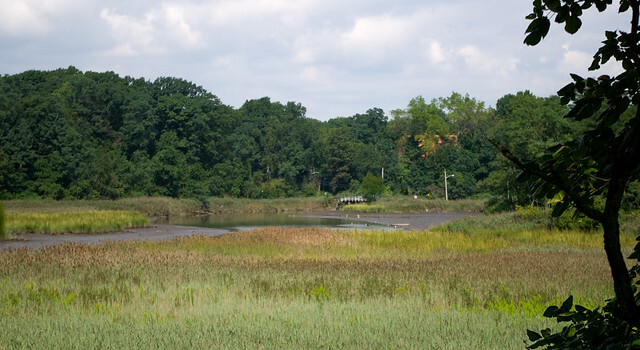 Today is the vernal equinox and first day of spring, which is encouraging for those of us who like to garden despite the fact that it still looks like winter outside. 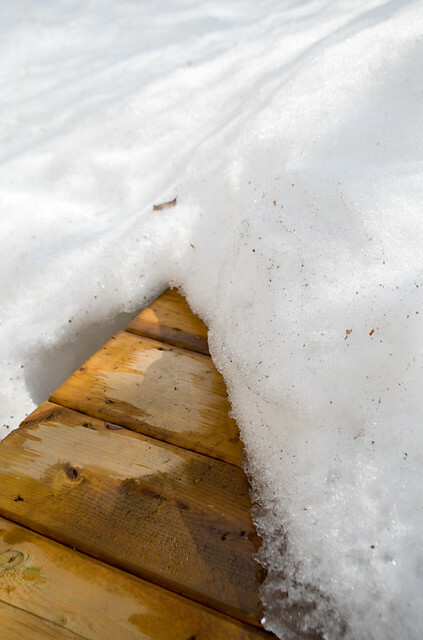 However, it has been peeking above freezing off and on for the last week, and things are finally starting to melt a bit. While my driveway is still a skating rink, I can finally see a bit of the back deck close to the house. I find myself rather envious of the people further south (or back in Madrid) where spring flowers are already pushing out of the ground and fruit blossoms are covering the trees. Ah well, our time will soon come! With the seasonal change comes the reminder that Ottawa ComicCon is only 50 days away — and I have to get cracking on costumes! Yesterday I popped out to purchase some fabric, although I haven’t found all of what I will need yet. (Today it’s all in the washer being pre-shrunk.) 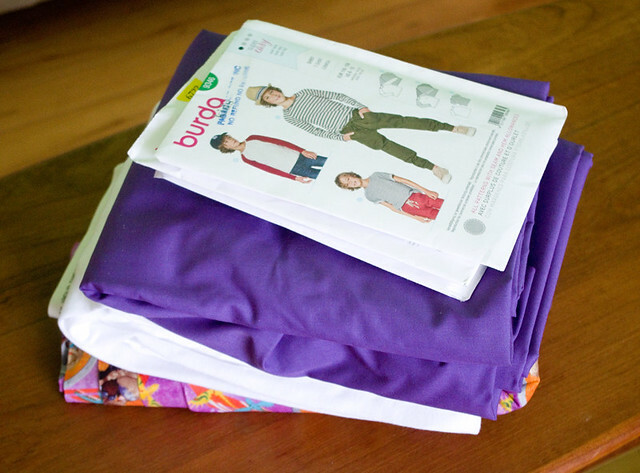 The purple and white fabric will mostly become Vio from The Legend of Zelda: Four Swords Adventures for Thing 1. I also need to purchase fabric for our other family costumes: Thing 2’s Sheik from The Legend of Zelda: Ocarina of Time and my Ganondorf from The Legend of Zelda: The Wind Waker. For group costumes on the weekend I also need to make a R.O.U.S. costume from The Princess Bride (I’m hoping to find a kigurumi pattern that I can modify) and a 1950’s version of Marrow from the X-Men comics. 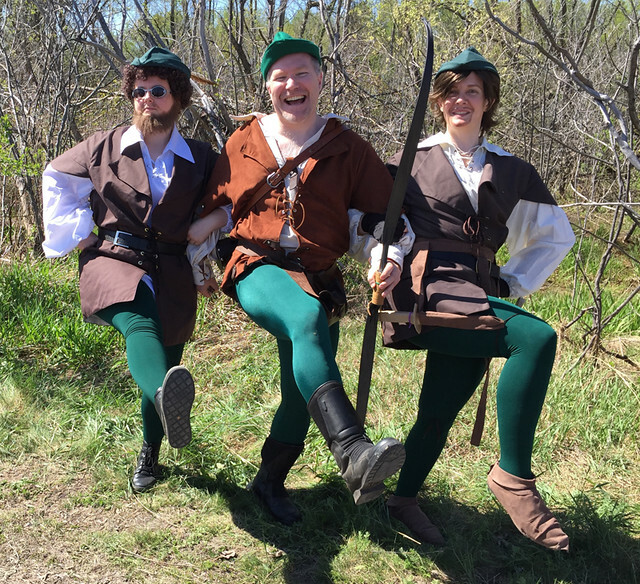 Over the weekend I also plan on wearing my Men in Tights costume again, which is the only one I don’t have to make this year. So that’s a total of five costumes I still have to sew, but at least there are no big builds this year? 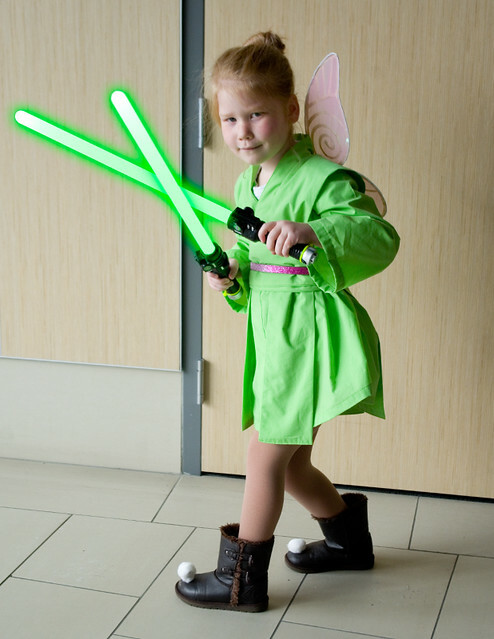 Thing 2 as Jedi Tinkerbell! I made her robe using McCall’s M6184: Children’s/Boys’/Girls’ Karate and Scrubs Costumes, but I used green broadcloth as the fabric. I also added two tabards and an obi/sash, which were basically tubes of fabric turned inside out and sewn closed at the end. The tights were Mondor dance tights that I purchased at a steep discount at the Audrey’s Costume Castle fire sale; the wings were from Value Village Halloween stock. I re-used the boots from Thing 1’s Astrid costume, and stuck pompoms on the toes with hot glue. The sparkly pink belt was from the kids’ wardrobe. Oh, and the knockoff “space swords” were cheapies from Walmart. 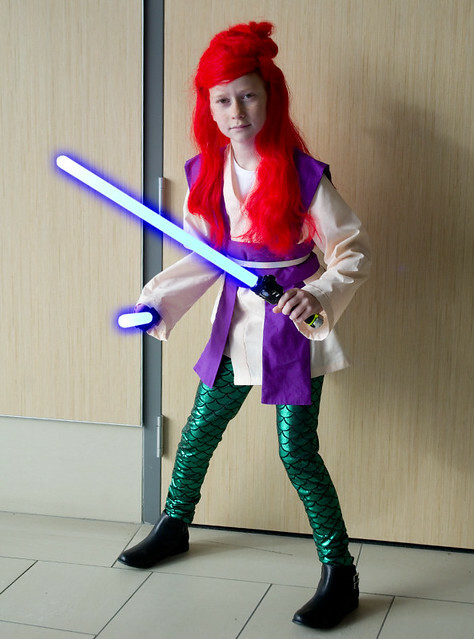 Thing 1 as Jedi Ariel! Her robe was made using a larger size of the same pattern as Tinkerbell, but in different colours of broadcloth; the tabards and obi were also made the same way as the first costume. I ordered the mermaid scale leggings off of Amazon since I couldn’t find any the right colour in town, and I was extremely lucky when they arrived this past Friday despite the postal strikes (the very last day they could have been in time). The half boots were from Joe on clearance, and the belt came from the kids’ closets. The wig was an inexpensive one from the Walmart Halloween section, and it was the only part of the costume that I was really disappointed with. It didn’t come out of the package looking anything like the picture on the front. Despite trying to style it to look Jedi-ish, it continued to look extremely cheap. I pinned it in about a million spots and it still wouldn’t stay looking halfway decent. I think Thing 1 only wore it for an hour before she gave up on it, and I honestly don’t blame her. Her real hair looked much better anyway. 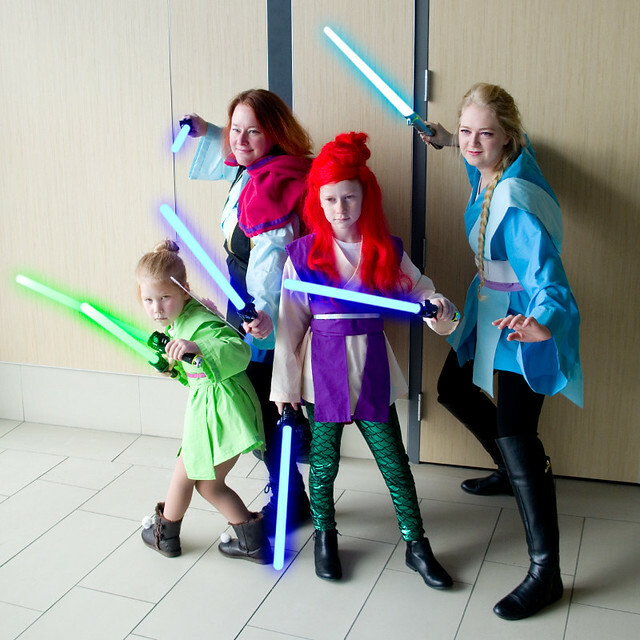 So here was our Disney Princess Jedi group for this mini con: Tinkerbell, Anna, Ariel, and Elsa. 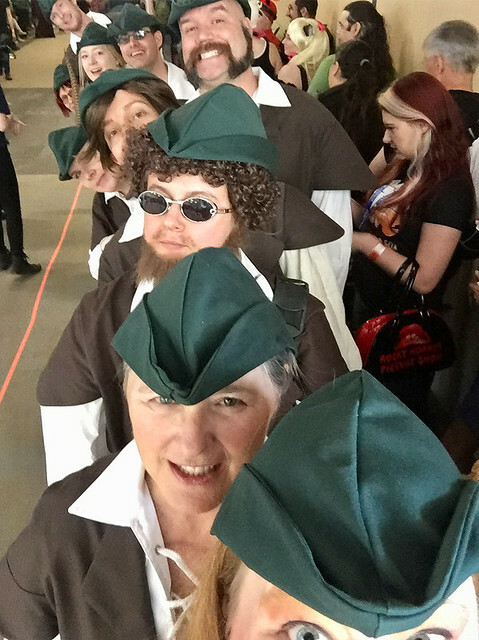 I’m hoping that we can convince more people to join us next year for a group cosplay! 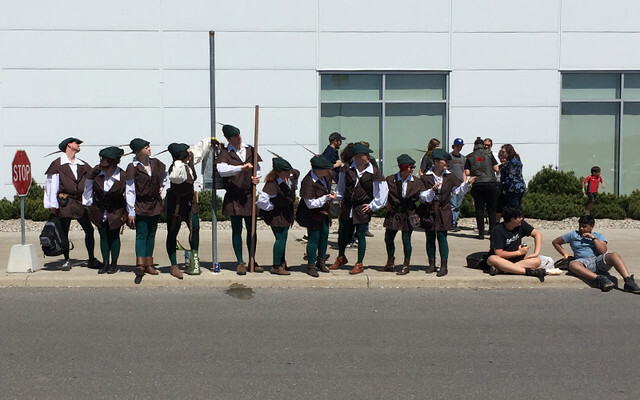 It was a lot of fun and the kids especially enjoyed a very enthusiastic reception. 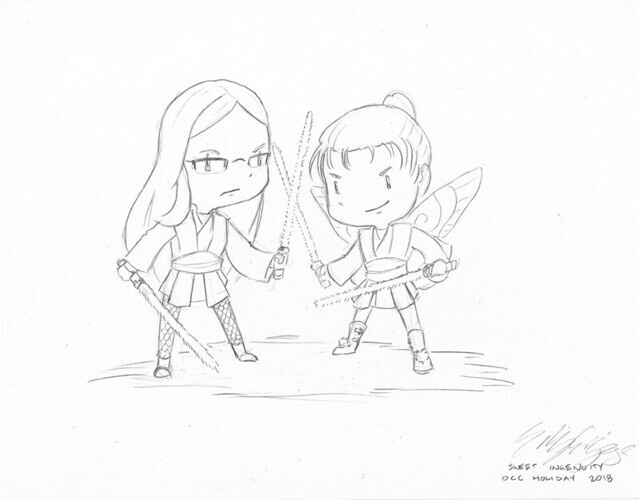 I also took the opportunity at the con to have one of my fave local artists, Emily Griggs of Sweet Ingenuity, do sketches of my girls in their costumes. I almost invariably buy something at her booth at every con I see her at, since her art is so much fun! I was really glad she was taking commissions at this con and had the time to draw my kids. I gotta say, they couldn’t have been more thrilled to see themselves in cartoon form. This art will take pride of place on my wall. My only regret about this con is that we forgot to go and get pictures outside in the snow! 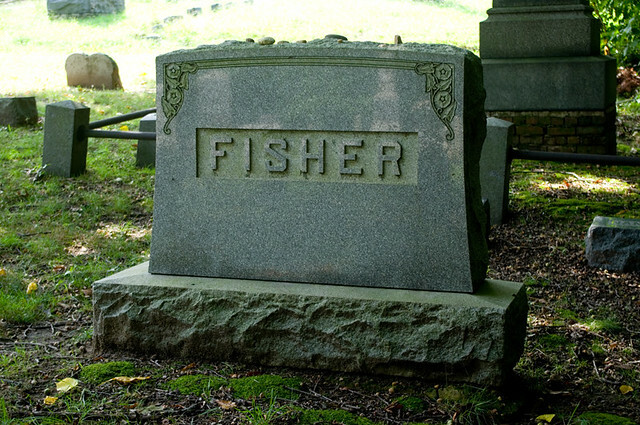 Oh well, we’ll just have to schedule a photo shoot sometime. 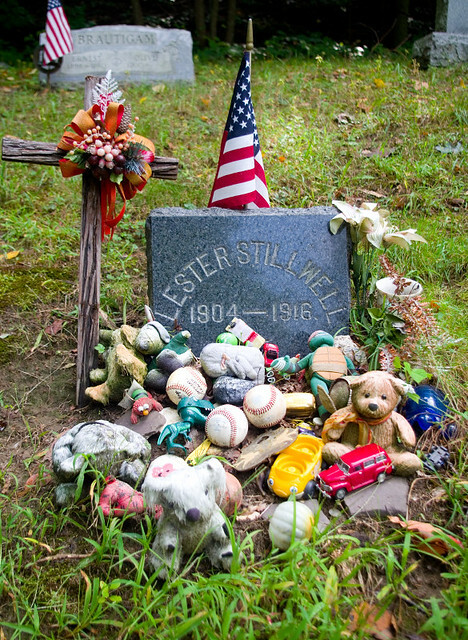 Halloween is all over but for the consumption of vast quantities of candy. Due to rainy weather, we didn’t get as many trick-or-treaters as I thought we would this year, so we have boxes of full-sized candy bars on top of what the kids accumulated. I think I’m going to have to Google “things to make with leftover Halloween candy”. 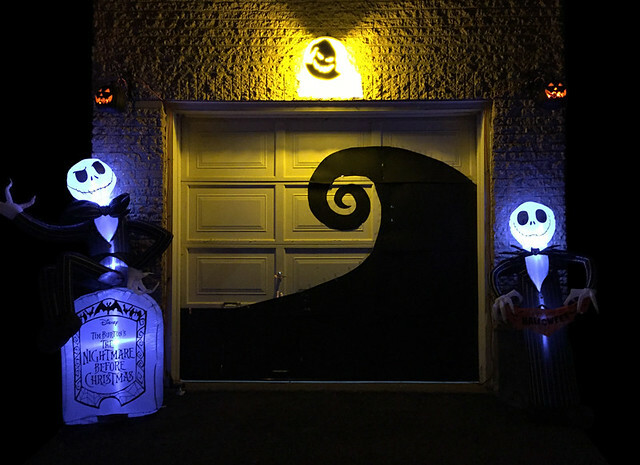 Of course, after Halloween there’s also lots of cleaning up and packing away to do, but before I get to that I’d like to share my favourite part of this year’s decorations: the Nightmare Before Christmas garage. You see, this year marks the 25th anniversary of one of my favourite movies (and Thing 2’s all-time fave so far), The Nightmare Before Christmas. I thought that part of my outdoor decor should definitely reflect this fact. I purchased the little Jack Skellington inflatable on the right, and the larger one on the left was a generous gift from a friend. I made the Oogie Boogie “moon” light cover out of a plastic platter, a black Bristol board cut-out, and a yellow light bulb. The “hill” on the garage door was just more Bristol board taped on and cut out in the desired shape, with breaks and slight overlaps between the panels so I could still open and close the door. 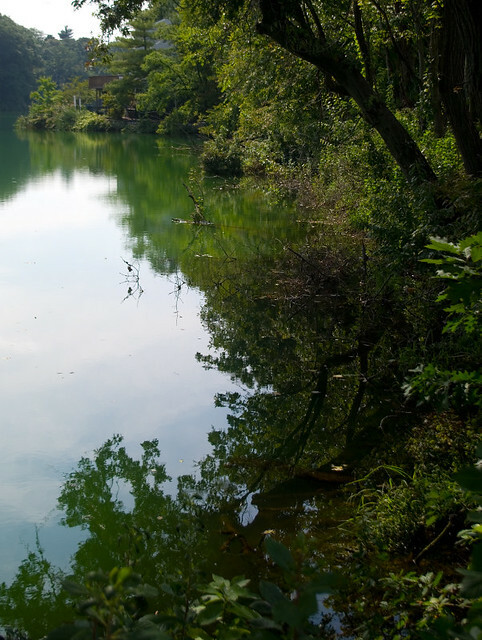 Honestly, it wasn’t terribly difficult, but I was really happy with it all in all. 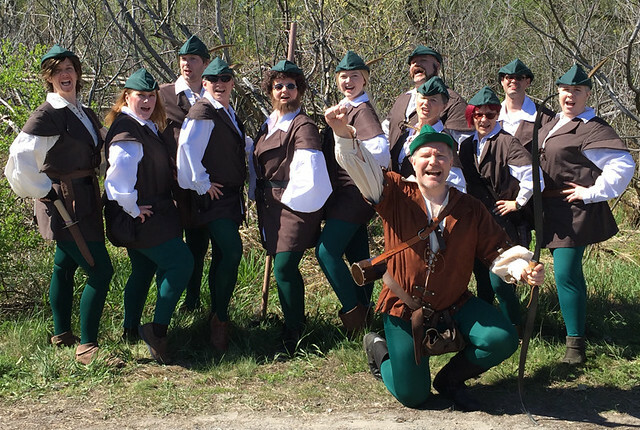 As for actual costumes the day of, I wore my Robin Hood: Men in Tights costume during the day, and my Discworld Death to take my kids trick-or-treating at night. 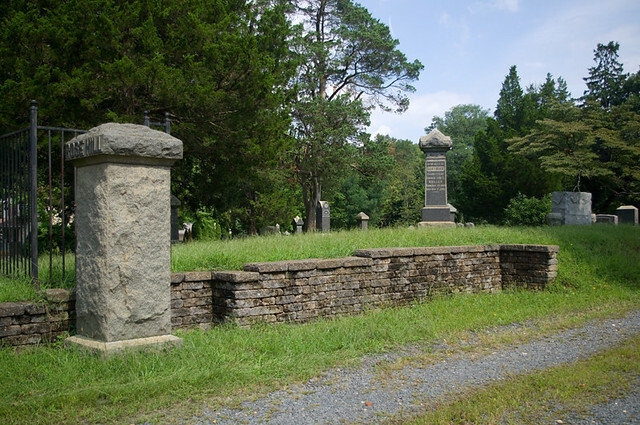 Death was very well received by most, although he did frighten a few little ones (he’s enormous, after all). I really did enjoy chasing the teenagers. The kids wore their Borderlands 2 costumes, and they were thrilled when a few people even knew who they were supposed to be. I’d say that it was a pretty great Halloween. Not only am I sick now, but so is the entire rest of my family, so there won’t be too much cooking going on for a bit. 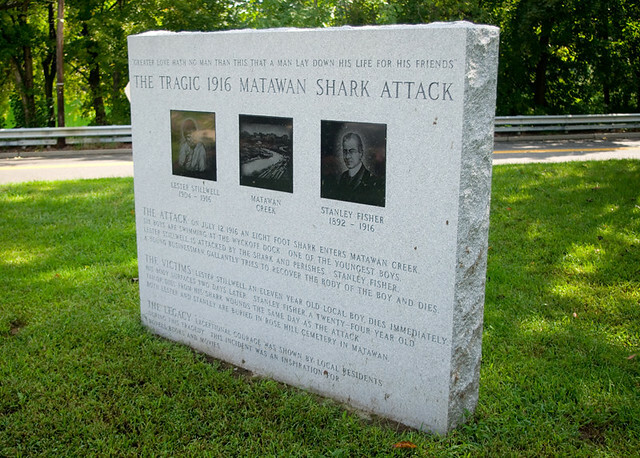 So I guess I will continue to regale you with tales of my trip to New Jersey since that was, if not an exotic location, definitely a fun one. 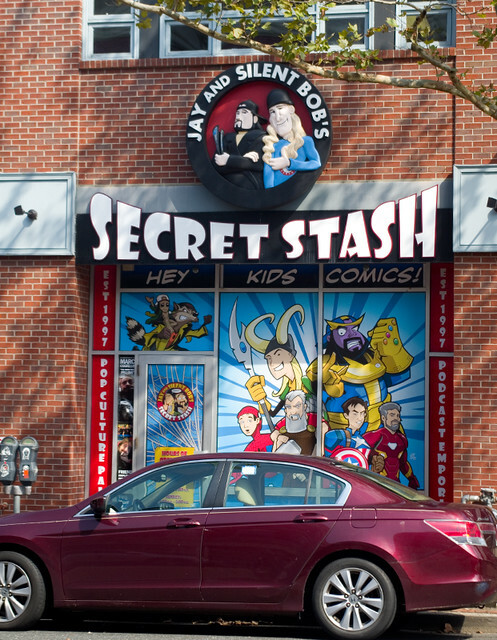 At a friend’s suggestion, I drove out to Jay and Silent Bob’s Secret Stash in Red Bank. For those not in the know, it’s a comic book store owned by Kevin Smith, who is the writer/director/actor of the View View Askewniverse movies (Clerks, Mallrats, Chasing Amy, Dogma, Jay and Silent Bob Strike Back, etc.) — among many other things. Honestly, it’s just a comic book store, which is something I am eminently familiar with back home; after all, I worked in one for a while back in high school. My main reason for visiting this particular store was a) the owner, and b) the movie ephemera from Smith’s movies that are displayed in glass cases on site. You see, Jay and Silent Bob Strike Back was the movie that my husband and I watched on our first date, so I kind of had to go check out the Secret Stash. 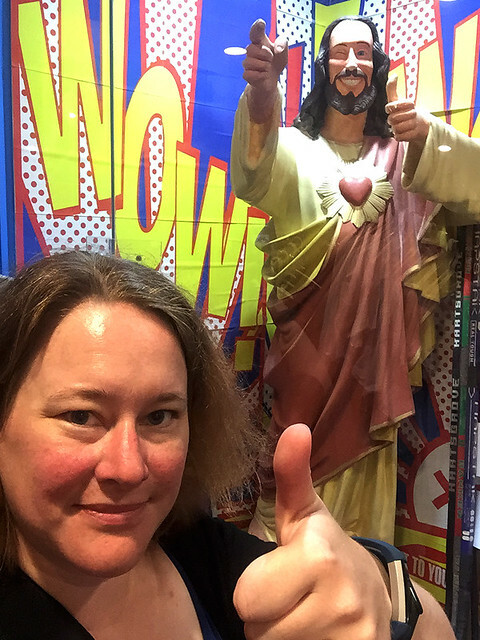 Of course, I had to get a selfie with Buddy Christ from Dogma. I don’t usually take selfies, but I made a special exception here. On my way out of the shop, I discovered that it is also a Pokéstop in PokémonGo, to my complete and utter lack of surprise — most comic book stores and geek-related places are. 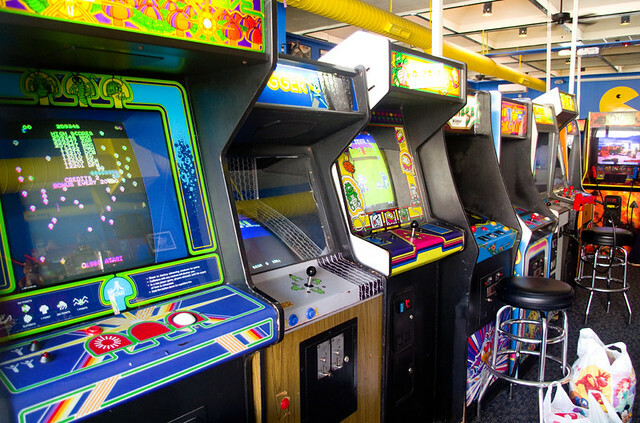 On my walk back to my car, I stumbled upon YESTERcades of Red Bank; with all of its windows open on that warm day, the sounds of the vintage video games drew me in. I discovered that instead of paying by the game, there you pay a flat hourly fee or buy a day pass, and you can play as many times as you want. At $8.75 per hour or $25 per day, that’s a lot less than I would have paid when I went to the arcade as a kid… What can I say, I like video games, but I die a lot. Honestly, if they had one of these in town, I know where I’d be taking my kids for their next birthdays! 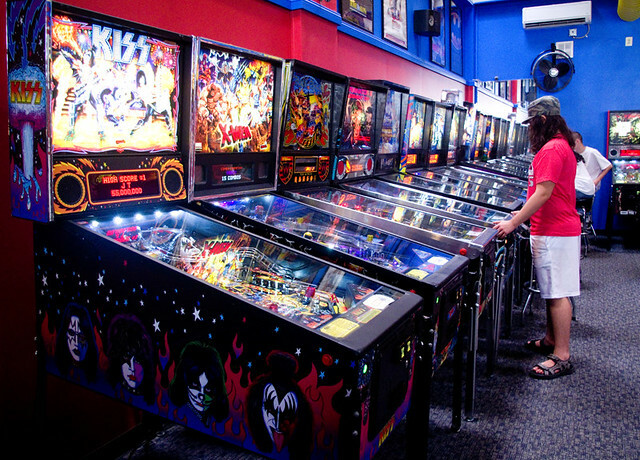 They had a wall of pinball games, more modern games with flat screens and couches, as well as a party room in the back. I’m pretty sure I recognized 95% of the games there and have played 75% of them at least once. 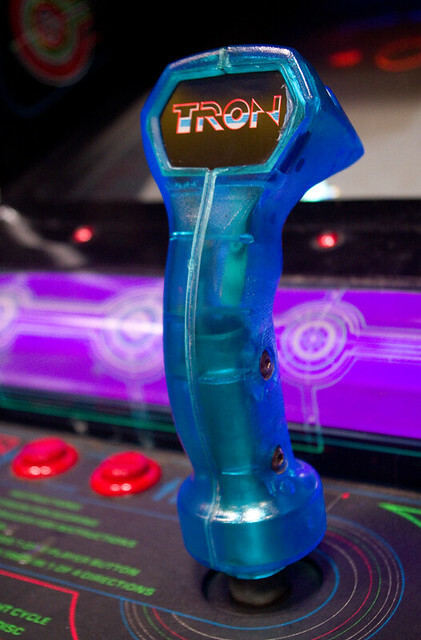 My fave find was their TRON cabinet, since it’s definitely the most meta video game I know of. I kind of want to show the pictures of the costumes that I made after the pro photos come in, so that it’s possible to see what they’re supposed to look like before I get into the pictures where my kids aren’t goofing off. (Not that I mind the goofing off, but it does make it difficult to see what’s going on with the costumes.) But there were some other great costumes that we saw on Friday that my kids didn’t pose with. 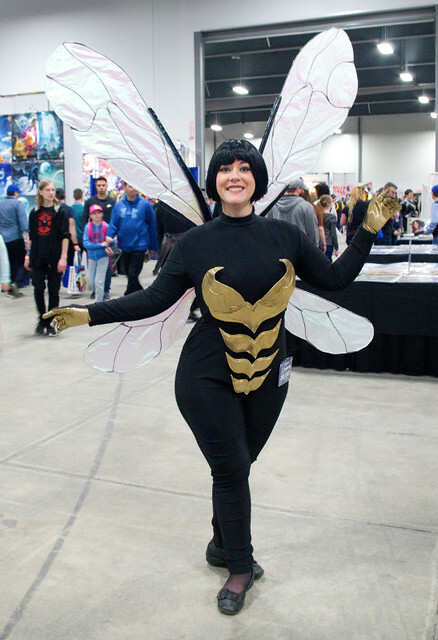 My kids have no idea who this comic book version of The Wasp is, although I’m guessing many people these days at least have an inkling since the Ant Man and The Wasp trailers have hit. I was very impressed by the fact that although there had to be a lot of structure under the suit to secure the wings, her outfit was smooth and nearly seamless. This is a trick that’s difficult to pull off in real life. 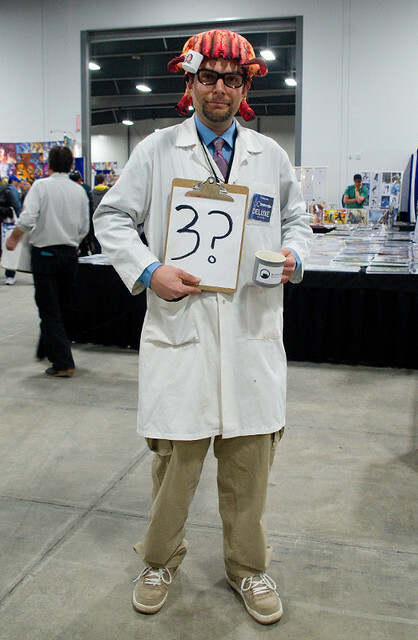 This Gordon Freeman with a headcrab asking about the release of Half Life 3 made me laugh — especially since the headcrab has its own tiny coffee mug. 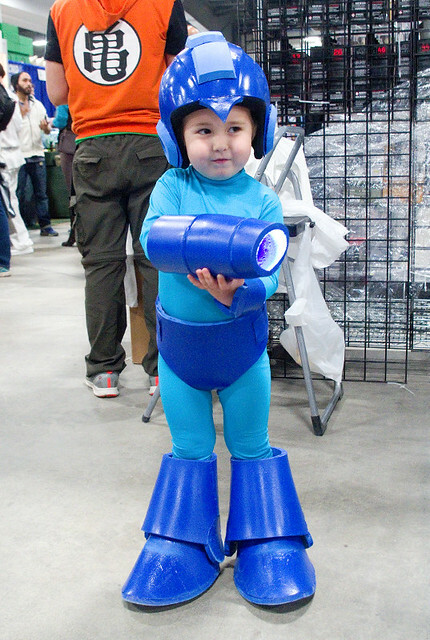 This tiny little Mega Man couldn’t have been more than four years old, and even so he had full-on armour and a blaster that lit up. I believe that this was an original steampunk character. 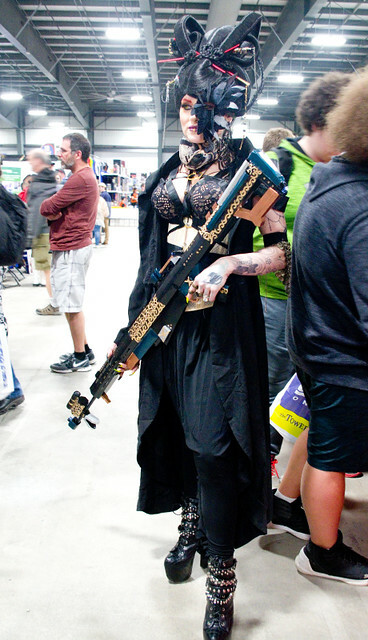 I was most impressed with her insanely complicated wig, and her gun that she’d made from scratch out of paper/cardboard! This daring outfit is Ryuko Matoi’s battle costume from the anime Kill la Kill. Given how much skin is showing, it presents a lot of logistical challenges (and probably uses a lot of body glue). This Harry Dresden from Jim Butcher’s novel series The Dresden Files was obviously based on the cover art, since he’s wearing a fedora (it’s an in-joke with fans that Harry never wears hats and actually rather dislikes them, but the publishers chose to add a fedora to the character on the covers as a kind of shorthand for a detective). 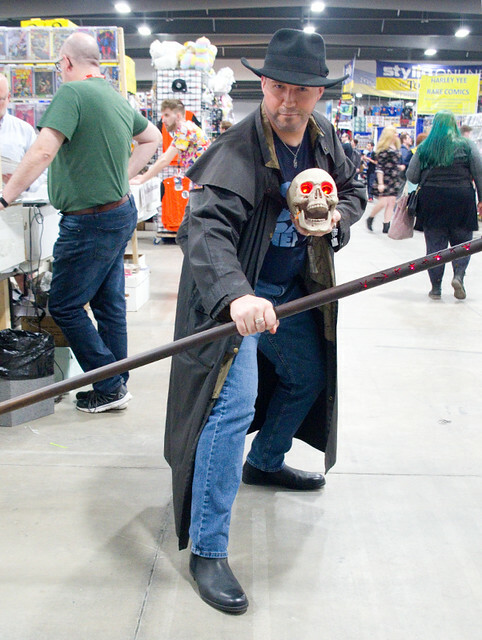 I liked that his wizard’s staff and that Bob the Skull‘s eyes lit up. 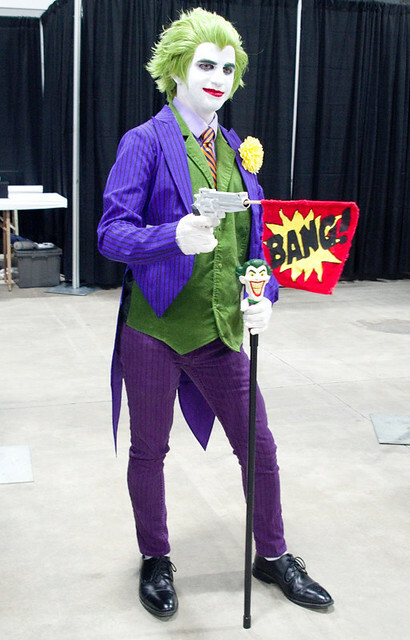 And of course where would we be without a great Joker? I’m still suffering from con plague, which in my case seems to mostly be a heavy-duty cold with severe sinus and ear pressure. I spent a good portion of yesterday and today huddled in bed, doped up on Tylenol Cold & Sinus, with the bedroom curtains closed because light hurt my eyes. 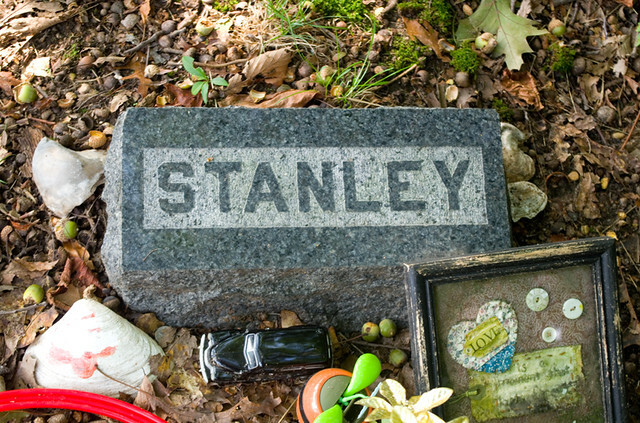 It’s been miserable. Not surprisingly, sitting in front of the computer with its bright screens was definitely not happening. Hence the late posts. 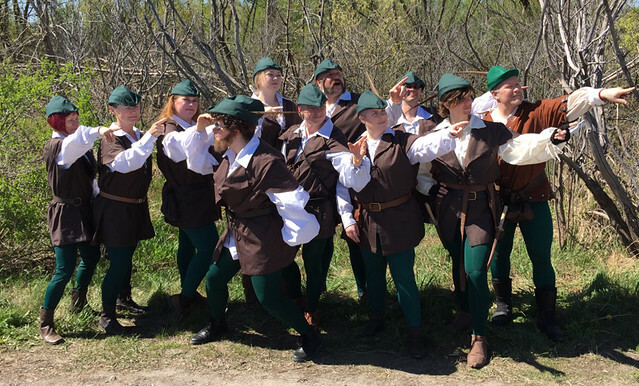 So, on Sunday a group of us went as Men in Tights from the 1993 parody Robin Hood: Men in Tights. We originally thought we’d only get five or six people to go along with the idea, but in the end there ended up being twelve of us! It was so much fun. We were stopped every couple of minutes at the con so people could take group photos, and we were told that we made many peoples’ day. Our group was missing some of the main characters, but we did have Blinkin (left), Robin (center), and Will Scarlet (right). And yes, if it’s not already completely obvious, many of our “men” in tights were actually women. 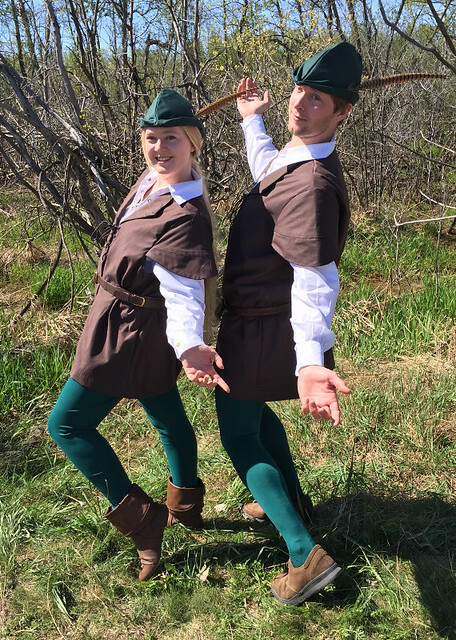 We took a lot of our photos poses from the Men in Tights dance number, such as “dance pose”, “manly men”, and “can-can”. 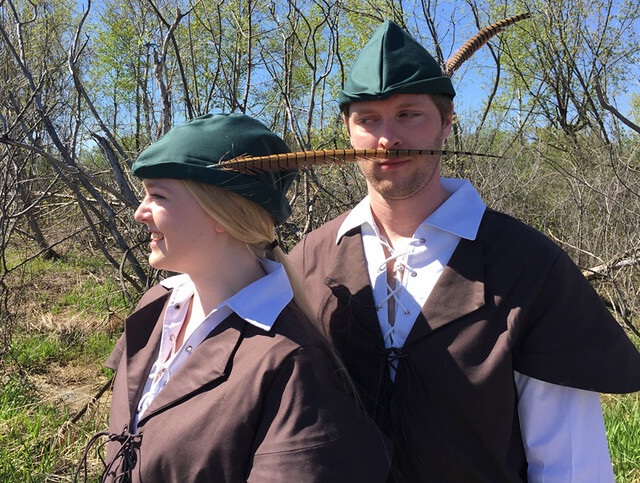 The costumes were extremely comfortable, with the only real inconvenience being the pheasant plumes that would regularly poke into peoples’ faces. Exactly where you were poked depended on height difference. 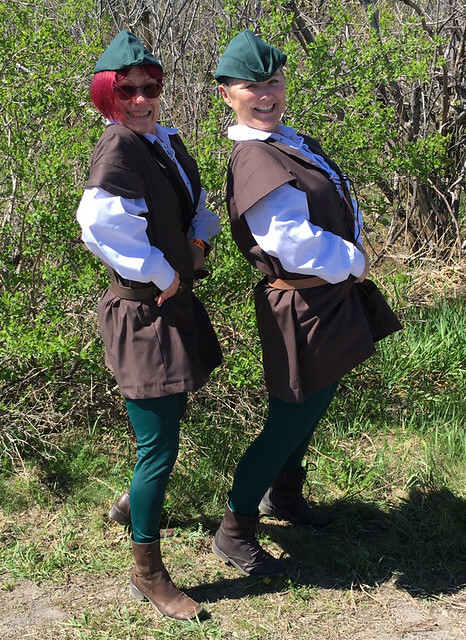 Sunday was also Mother’s Day, so I think it was great that my mother and I were part of the same cosplay group that day. 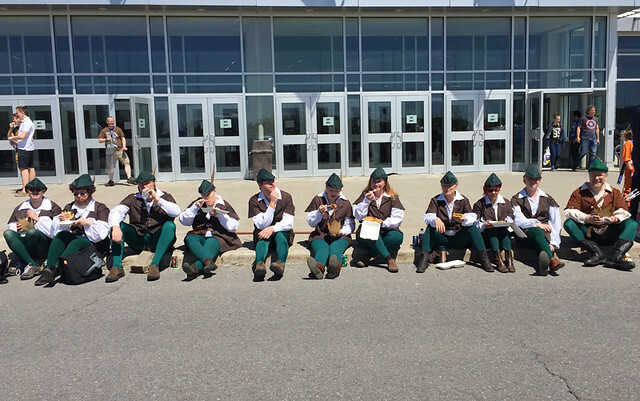 Of course, we had to have a lunch break. And then we had to pose as if waiting for the bus. All of us spent a while in line to attend the Masquerade awards ceremony, where one of the Men in Tights won a Best Mask ribbon in her very first masquerade for her Luna Lovegood Lion Head (which she’d worn the day prior). We are all so proud of her! – Tights: Any style from WeLoveColors in hunter green. – Vest and Hat: Butterick 4574 pattern, using Galaxy Twill in Forest for the hat and Galaxy Twill in Chocolate for the vest (both available at Fabricland). We also added a collar to the vest. 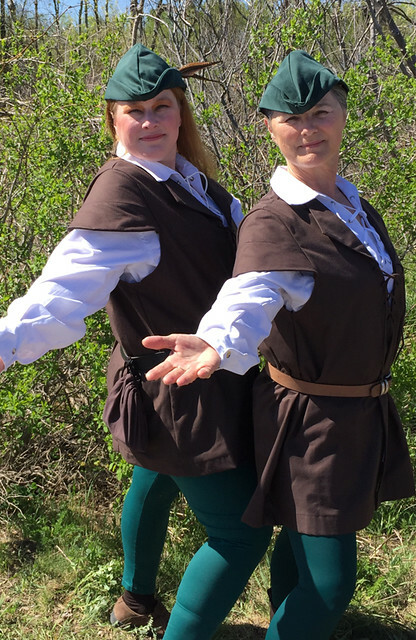 – Shirts: Some people made their shirts from white broadcloth and the shirt pattern in Butterick 4574; others (like myself) ordered the White Jacobite Ghillie Shirt Long Sleeve from UT Kilts. – Shoes: Since we went from a 5-6 men’s to a 13-14 men’s in size variance, we just went with whatever each individual could find that was close enough in looks (and comfy enough to wear all day on concrete floors). I have to say, this cosplay was the best time that I’ve had at a con in a long time. It was a lot of fun having people over to work on their costumes, and it was even more fun to invade the con as a group. And did I mention that I had a photo op with Matt Smith earlier that day? I was still in my costume at the time. When you’re getting your photo taken with a celebrity, you’re in there for like 15 seconds max, but in that time he did smile and say “Robin Hood!” approvingly, then pat me on the back. That was just the icing on the cake.